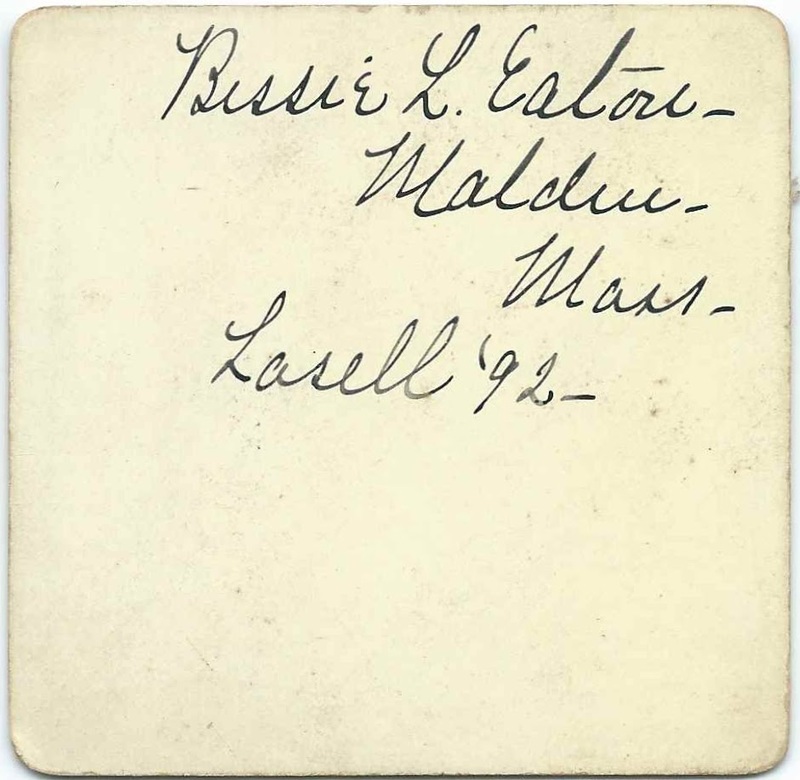 Photograph of a young woman identified on the reverse as "Bessie L. Eaton, Lasell '92". The photograph had to have been taken in the Fall of 1891 or in 1892, as Bessie's name appears in an article entitled "New Students" in an October 1891 issue of "Lasell Leaves". Then known as Lasell Seminary for Young Women, Lasell College is now a four year, coed college. It's located in the Auburndale section of Newton, Massachusetts. 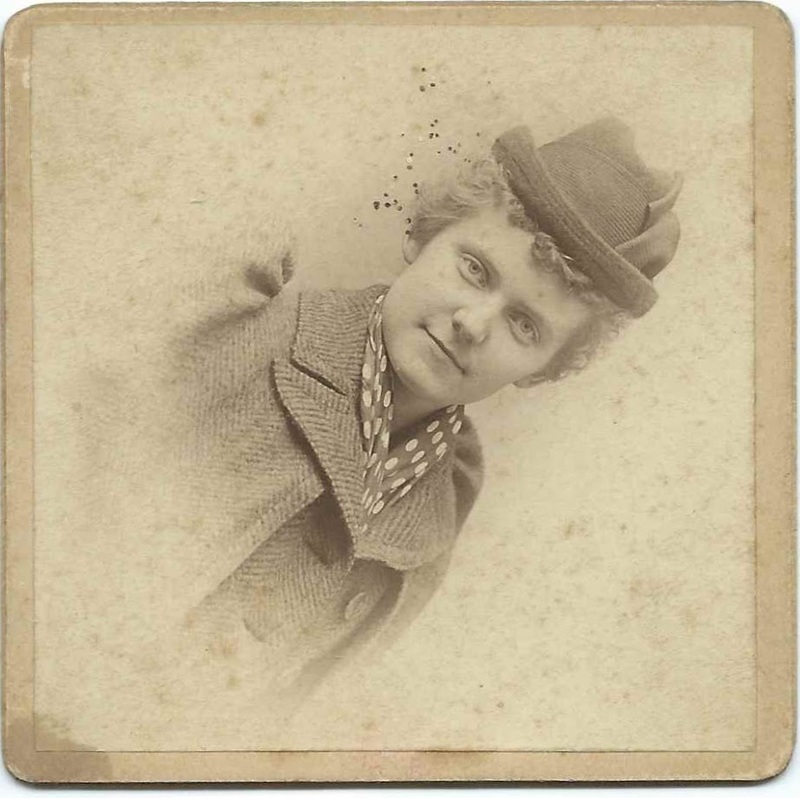 Bessie Lynde Eaton was born 29 April 1875 at Melrose, Massachusetts, the daughter of James Lynde Eaton and Grace Fletcher (Choate) Eaton, who were born at Malden, Massachusetts, and Beverly, Massachusetts, respectively. By the time of the 1900 Census of Malden, Massachusetts, Bessie was living with her parents. There was no occupation listed for her. Her father was a grocer. At some point in his life he became vice president of the S. S. Pierce Company. The 1910 Census showed the Bessie and her parents still at Malden and her father still working as a grocer. Again, no occupation was listed for Bessie. Bessie's father died in 1919. The 1920 Census showed Bessie and her mother still at Malden. Neither had an occupation listed. Bessie's father was a member of the Malden Historical Society. 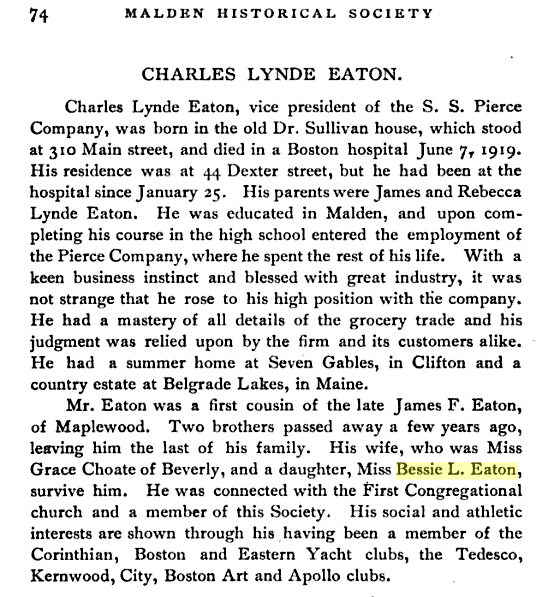 The 1919-1920 Register of the Malden Historical Society contains a necrology of Charles Lynde Eaton. It's interesting to this Mainer that he had a country estate at Belgrade Lakes, Maine. The family home in Malden was at 44 Dexter Street. As late as 1925, Bessie was still living with her mother, based on the Malden Massachusetts City Directory. A 1932 Directory listed Grace but not Bessie.